Click Here To See Painting In Matt and Frame! Back in 1994 John Romita drew 6 very nice black and white pen and ink cover recreations for the 1994 Sotheby's comic book and comic art auction. Those 6 covers (Daredevil #16, ASM 39, 50, 54, 64, and 100) sold very well. 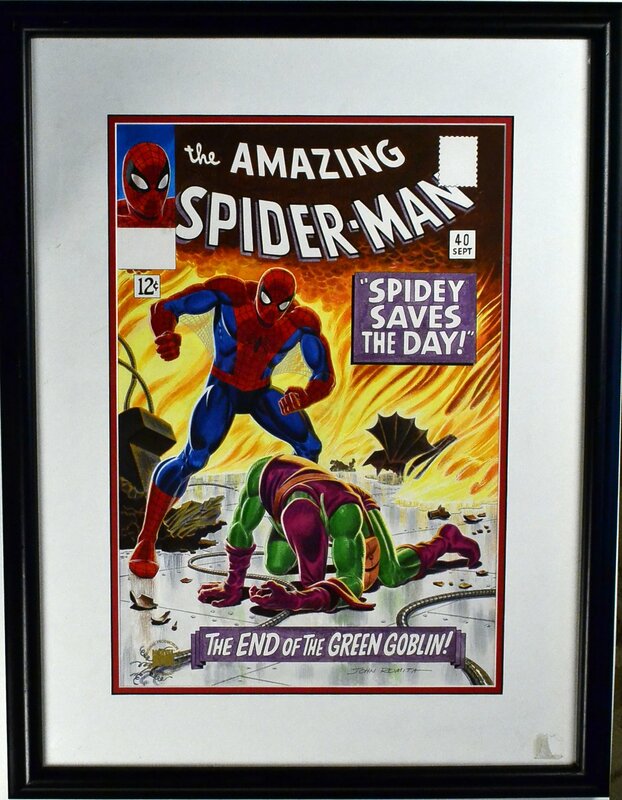 In 1995 John Romita was approached by CHRISTIE'S Auction house, and they wanted him to create just 1 amazing PAINTING for their auction, and they told John to create a 1 of a kind painting for whichever Amazing Spider-Man cover he felt would be sought after by collectors for their auction, So John Romita slaved over this Spider-Man / Green Goblin Masterpiece for over 2 MONTHS, trying to make it look PERFECT! Please notice when you look at the bigger scan here that there are "NO BLACK LINES" this is a bonafide "full" painting! Many artists ink first and then add lines to it...but that's the EASY way to create a painting...This stunning piece is all free hand painted! I emailed John Romita to quickly ask him if he can share a little bit about when he had to create this painting and here is John Romita's exact email about this Amazing painting: "The ASM 40 painting was very hard for me and took much longer than it should have...(almost 2 months) I did black+white art for so long, I had to try to recall how I did the recruiting posters in the Army in the early 50's...I penciled it lightly (erased the shiny graphite surface) then water colored the whole cover...then I dry brushed the details and shading...feeling my way slowly...held my breath the whole time...that's why I did as few color works as possible...John Romita" The painted area on this masterpiece measures a LARGE 15 by 21 inches on a much larger thicker art board and has been matted and framed. The Logo area and Corner box area with Spidey are ALL FREE HAND PAINTED artwork! This digital picture was taken THROUGH the frame and glass, so a little bit of the detail is lost. Click the red link above to see this awesome painting in the Mat, Glass, and Frame! 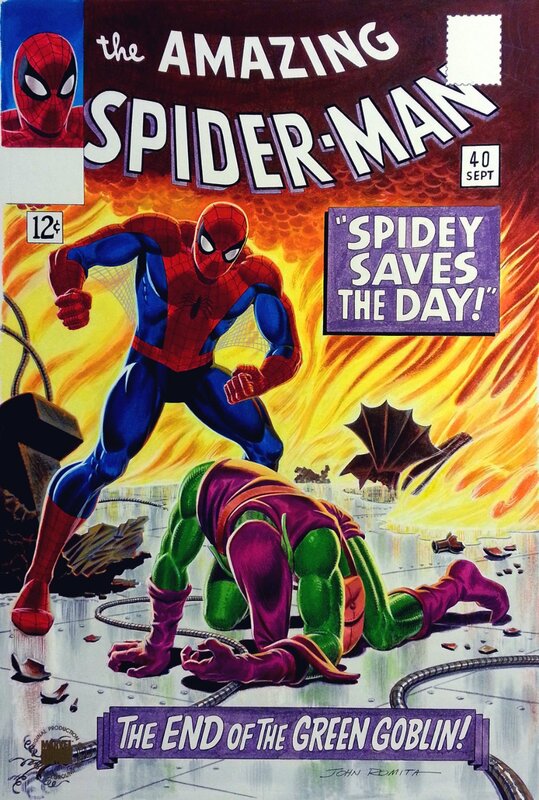 When you think about it...it took John Romita the same amount of time to start and finish this 1 painting as it did for him to pencil "AND" ink 2 complete LARGE ART Amazing Spider-Man books in the 1960's....40 pages! This piece right here is a truly 1 of a kind painting, and there will never EVER be another painting from this iconic artist, as John Romita vowed he will never EVER create another painting again! Incidentally.... The Amazing Spider-Man #100 black and white (inked only) cover recreation that John Romita drew in 1994 for the Sotheby's auction, sold in 2011 for $77,675.00, and it probably took John only a few days to draw that one! ALL HIGH end pieces of art, including this one, are able to be purchased with VERY fair time payment plan options, and trades are always considered towards this and "ANY" art on our website! Just send us an email to mikeburkey@aol.com and we can try to work something out.